I suppose it’s at this point that I should expect to be reminded that the UK has Mercian Cycles and Bob Jackson amongst others… well, yes, and very fine frames they are too, but maybe it’s just me… they seem to be somewhat ‘staid’ in outlook and lack individuality… ? Lots of tradiitonal class however. Anyway, I guess wait lists for Mercian for example are reasonable at around 5 months, Sacha White of Vanilla* has a wait list of around four years (and I believe has stopped taking new orders for the time being)… the price of individuality! 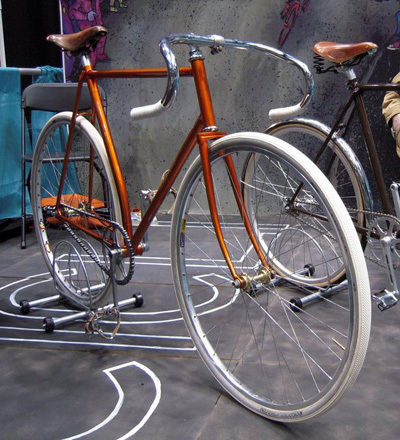 * do check out his bikes though, they are gorgeous…! PreviousPrevious post: « hadn’t really thought about racing…. A UK version would be great. In the mean time there is the First European Handmade Bicycle Exhibition http://www.e-h-b-e.eu/ being held in Germany this May.